Welcome to Round Two of my Documentaries You'll Love series. 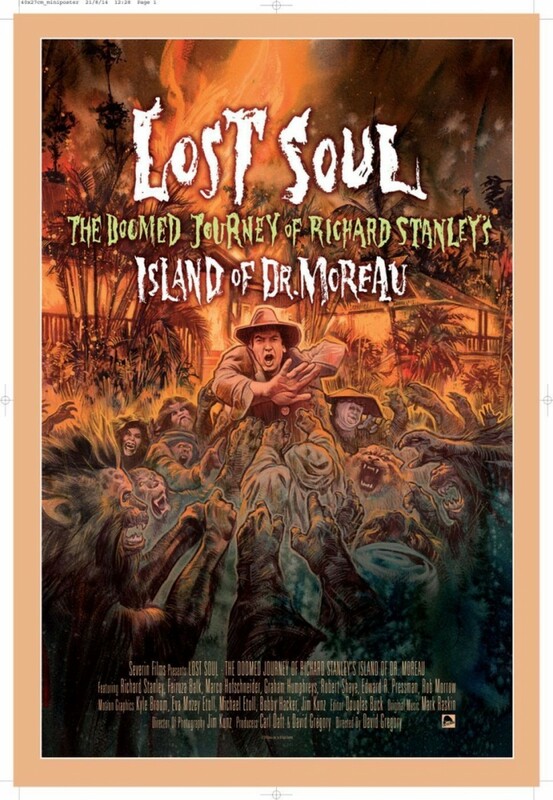 Lost Soul is the almost unbelievable documentary about the struggle to create a new vision of H.G Wells' novel, The Island of Dr. Moreau. Anyone who's been unfortunate enough to have seen this movie will recall how horrible it is. What with Marlon Brando's disdain for his craft and Val Kilmer's vanity, this project was doomed from the start. But, let's should start at the beginning. Richard Stanley was an up and coming director in the early 90's, having just made two successful sci-fi films on a shoestring budget. Richard's ancestor (Famous British explorer Sir Henry Morton Stanley) was, interestingly enough, someone who H.G. Wells modeled Dr. Moreau off of, as was Colonel Kurtz for Apocalypse Now). So, it felt like fate was leading Richard to make a more faithful adaptation of the work. He spent 2 years doing pre-production on it, sketching out scenes to storyboard his vision. 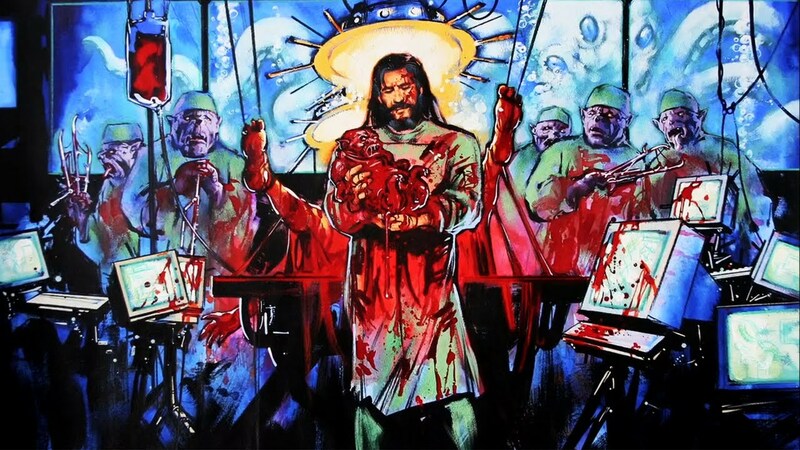 Here's one to give you an idea of what kind of off-beat vision he had in mind, showing Dr. Moreau as a Christ-like figure helping one of the hybrid animal-people give birth, attended by dog-men. Once Richard had a studio interested, he needed talent. He was to meet with Marlon Brando, whose involvement would guarantee a larger budget for the film. The studio had intended to buy the script from Richard and hire someone else to bring the film to life, but Richard had other plans. Before the meeting, he figured it would be a good idea to meet with a Warlock and have him cast a spell (No, that's not a typo) to ensure that the meeting would be successful. So, Richard and the producers went to Marlon's home to discuss the film. Marlon, being mischievous as he was known for, had the temperature turned up in his house, despite the already warm LA climate and soon enough the producer fell asleep, leaving Marlon and Richard to discuss the film. After the meeting, Marlon said he'd only do the film if Richard were to direct it. Now that they had an increased budget due to Marlon's involvement, they did scouting for the film. Eventually they settled on the Northern-most part of Australia's coastline, Queensland, because it had these great volcanoes in the horizon. What they hadn't known when they chose this location was that it rained the heaviest here and the volcanoes would only be visible for 1-2 hours a day. Shortly after filming began, Richard would have trouble being on the set and would ask for the production meetings to come to him. One person claims he climbed up a tree and refused to come down. (This is disputed by others in the doc.) Within a week of filming, the Producers decided to replace him as director, as the dailies were horrible and his behavior was described as erratic. He was to be brought to the airport and sent back home. But Richard didn't get aboard the plane. 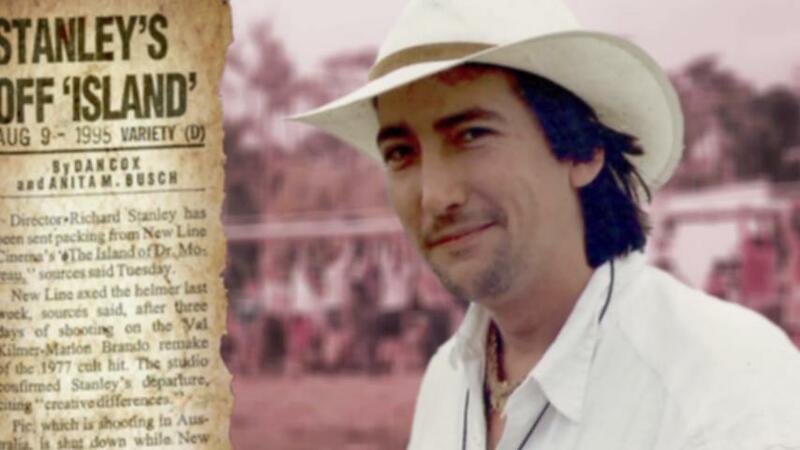 He missed the flight and hid in the jungles of Australia for months. Some PA's later found him in a haze of drugs and brought him back to their place. He eventually asked to be put in costume and snuck onto the set in a Dog-Man disguise so he could see what they were doing with his film. Richard still has the dog head in his possession, although it's deteriorated due to time. When Marlon finally flew in for filming, he was mourning the death of his daughter and was quite delayed in flying to the set. Upon his arrival, he immediately re-wrote his character, putting on Pierrot-esque makeup and insisted on being carried on a palanquin. Later he insisted they put a bucket with the top cut out for a hat and have them put ice on his head because he said his character couldn't stand the heat. There was also a German actor who had been hired to be Dr. Moreau's sidekick as the primary Dog-Man M'Ling, who would quote Shakespeare and have these amazing lines. But once Brando cast eyes upon one extra who'd been hired due to his height (he was the smallest man in the world) Brando insisted that he be his sidekick, saying, 'I'll teach him to act' (*despite him not speaking English). This was later parodied in South Park and also in Austin Powers with Mini-Me. I honestly don't know where to stop, as the documentary just devolves into further madness. I haven't even touched upon the fact that the first actor hired to be the main character quit after three days, calling his agent and begging him to be taken off the project. Also, David Thewlis, who was hired to replace the actor who went running for the hills, refused to go to the Red Carpet for the film or to talk of his experience on the set. There's just so much in this documentary, it borders on the realm of 'There's no way this could be true.' Then they show pictures of what they're describing and your jaw just drops. The film took a whopping 6 months to film! (Which is a long time, for those who aren't familiar with the process.) I would highly recommend this to anyone who saw The Island of Dr. Moreau and wondered, 'What the heck happened here?' And if you haven't seen it, you might want to avoid that and just watch this documentary. This is one of the most truly remarkable documentaries and it's a miracle they managed to turn that madness into a film, awful though it may be. Highly recommended.